During this time of year, when we think of all the benefits of being in our business, we quickly think of our relationships with great customers like you. Thank you for giving us the chance to do what we enjoy. 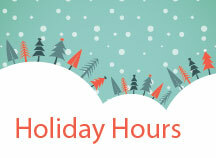 Below is just a reminder of our business hours this Holiday season. Please rest assured, we will return every message and email we receive on our next scheduled business day. 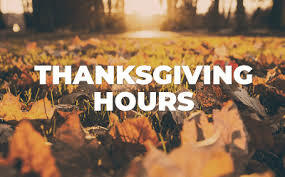 but will reopen on Monday, November 26, 2018. On Monday December 24, 2018 we will be open from 9a-12p. We will be closed on Tuesday, December 25, 2018. On Monday December 31, 2018, we will be open from 9a-12p. On Tuesday, January 1st, 2019, we will be closed.